Given the recent arrival into the world of Grace Belshaw, a lack of paternity leave due to not working for my current employers for the requisite amount of time, and an Easter deadline for my Ed.D., now would seem a good time to point out that you can download (for free!) my yearly Best of Belshaw books to peruse at your leisure. They’re iPad-friendly and convert well for viewing on the Amazon Kindle and other e-book readers. PS If you like my writing and want to check out the only for-profit book I’ve written so far click here. Design the (e-)book cover for #movemeon! 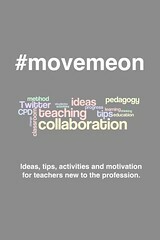 I’m very pleased to see that other educators have run with the #movemeon idea I floated. There are now literally hundreds of tweets that have been tagged – you can view them in real-time here, or an archive here. I’ve put together a wiki at http://movemeon.wikispaces.com to depersonalise things – it’s about the ideas and the collaboration, not me, after all! You’ll find the same links as I’ve given above over there. 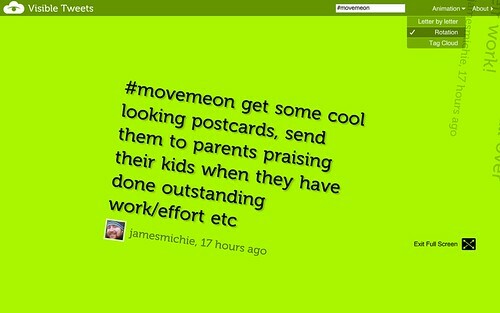 Update: view the latest #movemeon tweets via Twitter Search! If you’ve been living under a rock, Twitter is a communications medium limited to 140-characters that has taken the world by storm. If you’re baffled by what’s below, the hashtag (first proposed by Chris Messina in 2007) allows ‘channels’ to be created in Twitter. These can be followed by services like TwitterFall.